A while back, on the Thursday night Twitter chat-fest we call South Pacific Book Chat (#spbkchat), the topic was New Zealand literature, and I was cast in the unusual position of a mute bystander, having only read works by Katherine Mansfield (exquisite short stories, poignant and thought provoking) and Lynley Dodd (Hairy Maclarey from Donaldson’s Dairy). The Daylight and The Dust is a selection of Frame’s short stories, gleaned from her various collections, ranging from the early 1950s to the end of her life. There is a staggering variety in the selection, with serious, thought-provoking psychological tales brushing shoulders with whimsical childhood memories and ultra-short stories which are over almost before you’ve realised you’re reading them. Several of the stories are set in London, and this colonial view of life in the mother country reminded me a little of V.S. Naipaul’s short fiction, written around the same time. Of course, as a Kiwi writer, it’s rather obvious to say that Frame’s writing is influenced by Mansfield (I’m not sure anyone from New Zealand could write short stories without sensing her shadow looming heavy in the background), but there is a definite similarity in some of the themes covered. One example of this is The Tea Cup, a story about a woman sharing lodgings and tentatively trying to create a connection with a male fellow lodger. The subtle desperation exuding from the poor, lonely woman reminded me of several of Mansfield’s eternal spinster characters, wonderful women destined to live and die alone, unloved. The idea is also helped by Frame’s light, airy style, with both the language and the events of the story appearing at first to be quite trivial while masking great sadness and inner torment. Another story touching on a sense of unfulfilment (if that’s a word!) is The Triumph of Poetry – one of the longer stories in the book -, which follows a man from his very successful school days through his moderately successful life, always reminding the reader of the hero’s failure to become a real poet, life having got in the way. Despite the character’s apparent professional and personal happiness, Frame skilfully weaves an air of unhappiness between the lines, leaving the reader with the sense of what might have been. One of the interesting features of this book was the number of very short stories, ludicrously brief in some cases. One, the title story, barely reached two hundred words (and I have to say that it wasn’t one of my favourites…), and there were several others which were a little over a page long. However, even in some of these shorter efforts, there was some wonderful writing. In Dossy, a story taking up just under two pages of very uncluttered text, the little girl featured goes from being a Queen bee to an envious poor girl to a doomed orphan in the space of a few hundred words (and three differing viewpoints) – a wonderful achievement. The Daylight and The Dust is a nice introduction to an obviously talented writer, but it is a little like an appetiser before the main meal. I’m more of a Victorian pot-boiler man than a short-story afficionado, and these stories have merely whetted my appetite for something a little lengthier. So, to finish up today, I’ll turn the spotlight back on my audience and ask: have you read any of Frame’s novels? What would you recommend? Thanks for the mention, Tony! I can't claim to be a diligent reader of Janet Frame's novels (I hope they won't ask for the prize back now…). But I have read her first novel, “Owls Do Cry”, the later “Living in the Maniototo” and the posthumously-published “Towards Another Summer” (2007). I enjoyed “Towards Another Summer” the most: I think that, if it had ben possible to read this novel before reading the others, I'd have got into her work a lot more. On the other hand, if you're up for a challenge, then “Living in the Maniototo” is worth the effort! I haven't read any of Frame's novels, but I'm planning on getting Owls Do Cry from my library this week. 🙂 I like to start reading authors with their first novel whenever possible, so that's why I picked it! 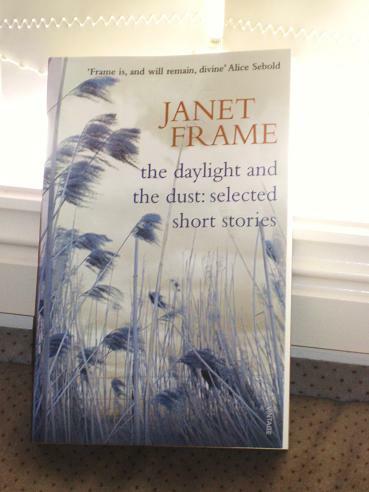 I have only read some of Frame's short stories, plus her autobiography, which is a must-read. The poor woman narrowly missed being lobotomised! It really is a harrowing story. Anyway, thanks for the great post, which has reminded me that I really should read some of Frames' novels. I'll check to back to see what others recommend. Oh, and congrats to Tim Jones on winning the award! And congrats again – I'm sure they're not too strict on the reading criterion (I'd bet not all of the Miles Franklin Award winners have read one of her books!). This edition is printed by Virago here with the same exquisite cover. I am ashamed that I have not yet picked up my copy yet but you have certainly intrigued me with the (obvious or not) comparisons with Katherine Mansfield.